THE TERMS OF SALE BELOW CONTAIN VERY IMPORTANT INFORMATION REGARDING YOUR RIGHTS AND OBLIGATIONS, AS WELL AS CONDITIONS, LIMITATIONS AND EXCLUSIONS THAT MIGHT APPLY TO YOU. PLEASE READ IT CAREFULLY. THE TERMS OF SALE REQUIRE THE USE OF ARBITRATION ON AN INDIVIDUAL BASIS TO RESOLVE DISPUTES, RATHER THAN JURY TRIALS OR CLASS ACTIONS. BY PLACING AN ORDER FOR THE PRODUCTS OR SERVICES FROM THIS WEBSITE, YOU AFFIRM THAT YOU ARE OF LEGAL AGE TO ENTER INTO THIS AGREEMENT, AND YOU ACCEPT AND ARE BOUND BY THE TERMS OF SALE. YOU FURTHER AFFIRM THAT IF YOU PLACE AN ORDER ON BEHALF OF AN ORGANIZATION, COMPANY OR OTHER ENTITY, YOU HAVE THE LEGAL AUTHORITY TO BIND SUCH ORGANIZATION, COMPANY OR ENTITY TO THE TERMS OF SALE. YOU MAY NOT ORDER OR OBTAIN PRODUCTS OR SERVICES FROM THIS WEBSITE IF YOU (A) DO NOT AGREE TO THE TERMS OF SALE, (B) ARE NOT THE OLDER OF (i) AT LEAST 18 YEARS OF AGE OR (ii) LEGAL AGE TO FORM A BINDING CONTRACT WITH LEARNHEALTH, INC., OR (C) ARE PROHIBITED FROM ACCESSING OR USING THIS WEBSITE OR ANY OF THIS WEBSITE’S CONTENTS, GOODS OR SERVICES BY APPLICABLE LAW. 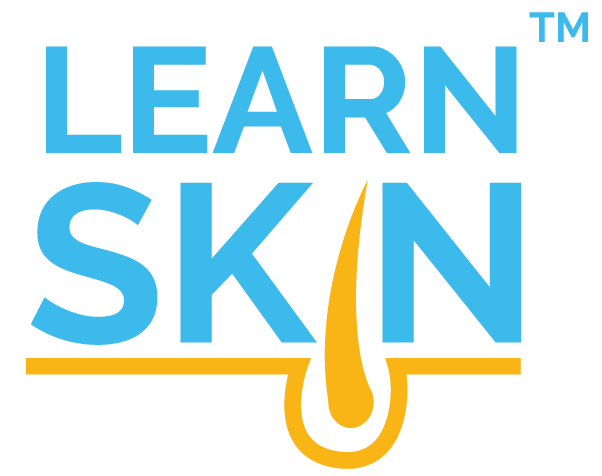 These Terms of Sale (these "Terms") apply to the purchase and sale of products and services offered by LearnHealth, Inc. or its parents or subsidiaries (collectively, "LearnHealth", "we" or "us") through www.learnskin.com (the "Site"). We may change these Terms without prior written notice at any time, in our sole discretion. Any changes to these Terms will be effective immediately when we post them. You should review these Terms prior to purchasing any products or services that are available through the Site. Your continued use of the Site after the posting of the revised Terms will constitute your acceptance of and agreement to such revised Terms. You agree that your order is an offer to buy, under these Terms, all products and services listed in your order. All orders must be accepted by us or we will not be obligated to sell the products or services to you. We may choose not to accept orders, in our sole discretion, even after we send you a confirmation email with your order number (if any) and details of the items you have ordered. All prices, discounts and promotions posted on the Site are subject to change without notice. The price charged for a product or service will be the price in effect at the time the order is placed. Price increases will only apply to orders placed after such increase. We strive to display accurate pricing information, however we may, on occasion, make inadvertent typographical errors, inaccuracies or omissions related to pricing and availability. We reserve the right to correct any errors, inaccuracies or omissions at any time and to cancel any orders arising from such occurrences. Terms of payment are within our sole discretion and payment must be received by us before our acceptance of an order. We accept payment via Stripe for all purchases on the Site. You represent and warrant that (i) the credit card information you supply to us is true, correct and complete, (ii) you are duly authorized to use such credit card for the purchase, (iii) charges incurred by you will be honored by your credit card company and (iv) you will pay charges incurred by you at the posted prices, including all applicable taxes, if any, regardless of the amount quoted on the Site at the time of your order. While we use reasonable efforts to make sure that any testing materials provided on the Site satisfy the applicable requirements of all jurisdictions, you understand that we cannot and do not guarantee that (1) all the testing materials will always be current and meet all of the applicable guidelines in each jurisdiction, (2) successfully completing the tests on the Site will maintain any applicable license or authority you may have in any particular jurisdiction and/or (3) that your test results will in all instances be successfully transmitted to each jurisdiction. In addition, you agree that we shall not be responsible for and do not assume any liability because of any errors that occur as a result of data transmission errors. Although we will use reasonable efforts to avoid such data transmission errors, it is possible that data transmission errors will result in erroneous test results, test results being transmitted to the wrong jurisdiction or authority or an error in processing by the jurisdiction or authority to whom data is transmitted. You understand and agree that all materials on the Site are provided for educational and testing purposes only. None of the materials provided on the Site are designed to be diagnostic, predictive or to constitute any particular prescription for a particular course of action in a particular circumstance or set of facts. You understand and agree that we do not, in any way, guarantee, represent or warrant that the use of any particular course of treatment or diagnosis described in any of the materials on the Site is correct, best practice or recommended in any particular set of circumstances, facts or location. ALL PRODUCTS AND SERVICES OFFERED ON THE SITE ARE PROVIDED “AS-IS” WITHOUT ANY WARRANTY WHATSOEVER, WITHOUT LIMITATION, ANY (A) WARRANTY OF MERCHANTABILITY, (B) WARRANTY OF FITNESS FOR A PARTICULAR PURPOSE OR (C) WARRANTY AGAINST INFRINGEMENT OF INTELLECTUAL PROPERTY RIGHTS OF A THIRD PARTY, IN EACH CASE, WHETHER EXPRESS OR IMPLIED BY LAW, COURSE OF DEALING, COURSE OF PERFORMANCE, USAGE OF TRADE, OR OTHERWISE. OUR SOLE AND ENTIRE MAXIMUM LIABILITY AND YOUR SOLE AND EXCLUSIVE REMEDY SHALL BE LIMITED TO THE ACTUAL AMOUNT PAID BY YOU FOR THE PRODUCTS AND SERVICES YOU HAVE ORDERED THROUGH THE SITE. YOU AND LEARNHEALTH ARE AGREEING TO GIVE UP ANY RIGHTS TO LITIGATE CLAIMS IN A COURT OR BEFORE A JURY, OR TO PARTICIPATE IN A CLASS ACTION OR REPRESENTATIVE ACTION WITH RESPECT TO A CLAIM. OTHER RIGHTS THAT YOU WOULD HAVE IF YOU WENT TO COURT MAY ALSO BE UNAVAILABLE OR MAY BE LIMITED IN ARBITRATION. The arbitration will be administered by the American Arbitration Association (the “AAA”) in accordance with the then-applicable rules of the AAA with the arbitration to be held in Sacramento, California. The arbitrator will have exclusive authority to resolve any dispute relating to arbitrability and/or enforceability of this arbitration provision, including any unconscionability challenge or any other challenge that the arbitration provision or the agreement is void, voidable, or otherwise invalid. The arbitrator will be empowered to grant whatever relief would be available in court under law or in equity. Any award of the arbitrator(s) will be final and binding on each of the parties, and may be entered as a judgment in any court of competent jurisdiction. You may elect to pursue your claim in small-claims court rather than arbitration if you provide us with written notice of your intention do so within sixty (60) days of your purchase. The arbitration or small-claims court proceeding will be limited solely to your individual dispute or controversy. You agree to an arbitration on an individual basis. In any dispute, NEITHER YOU NOR LEARNHEALTH WILL BE ENTITLED TO JOIN OR CONSOLIDATE CLAIMS BY OR AGAINST OTHER CUSTOMERS IN COURT OR IN ARBITRATION OR OTHERWISE PARTICIPATE IN ANY CLAIM AS A CLASS REPRESENTATIVE, CLASS MEMBER OR IN A PRIVATE ATTORNEY GENERAL CAPACITY. The arbitral tribunal may not consolidate more than one person’s claims, and may not otherwise preside over any form of a representative or class proceeding. The arbitral tribunal has no power to consider the enforceability of this class arbitration waiver and any challenge to the class arbitration waiver may only be raised in a court of competent jurisdiction. You may not assign any of your rights or delegate any of your obligations under these Terms without our prior written consent. Any purported assignment or delegation in violation of this section shall be null and void. No assignment or delegation relieves you of any of your obligations under these Terms. The failure by us to enforce any right or provision of these Terms will not constitute a waiver of future enforcement of that right or provision. The waiver of any right or provision will be effective only if in writing and signed by a duly authorized representative of LearnHealth.